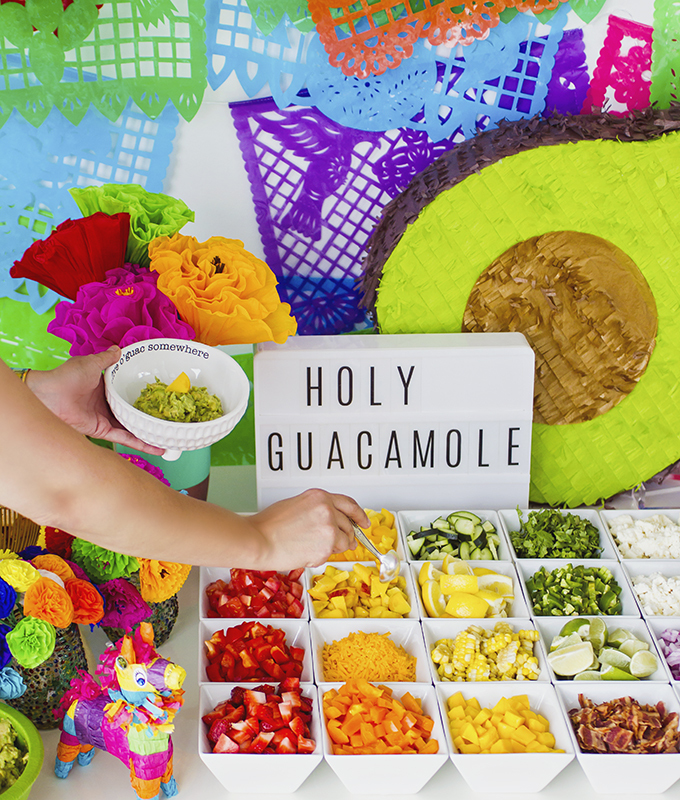 A DIY guacamole bar that's perfect for Cinco de Mayo! 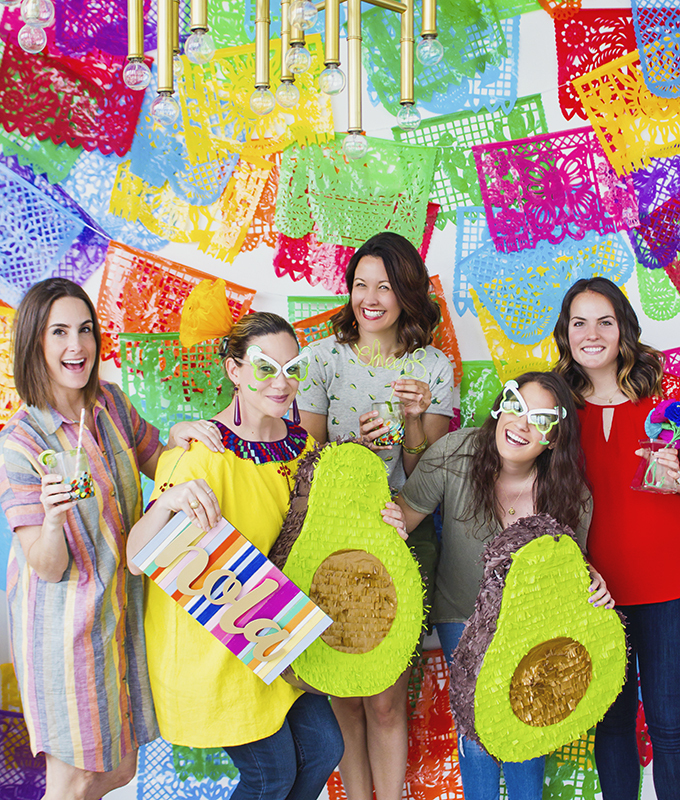 With Cinco de Mayo coming up, and just our general love for obsession with guacamole, we knew we had to have an avocado themed party. 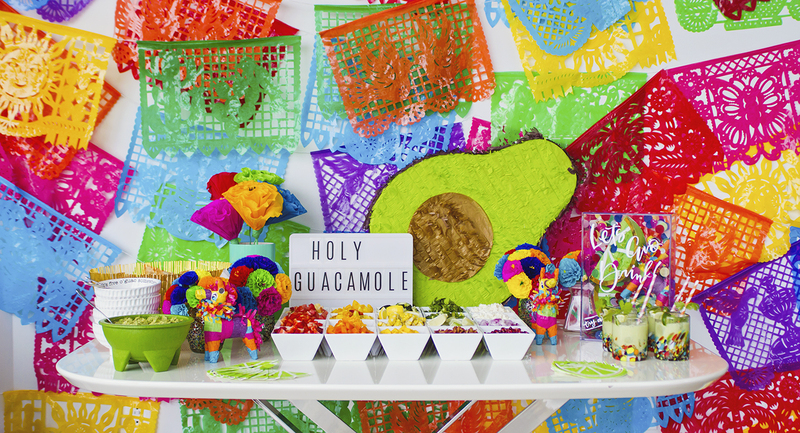 Our initial party-worthy idea was an over-the-top DIY guacamole bar! But of course we couldn’t just leave it at that. 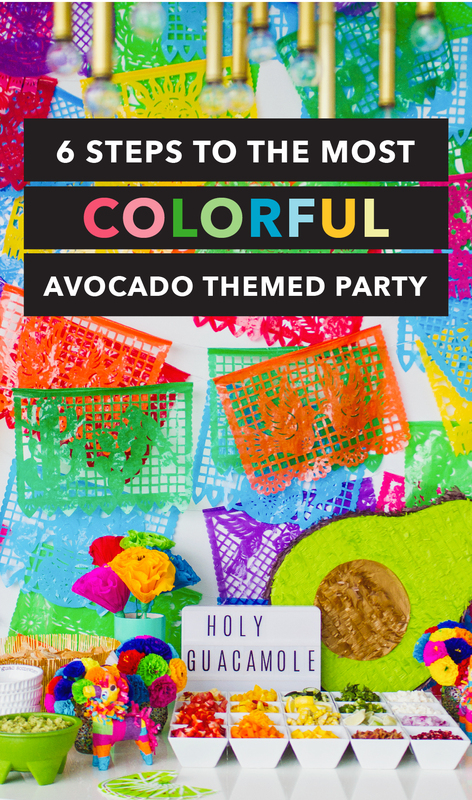 We added several other fun, colorful components to make this truly the best avocado themed party ever. 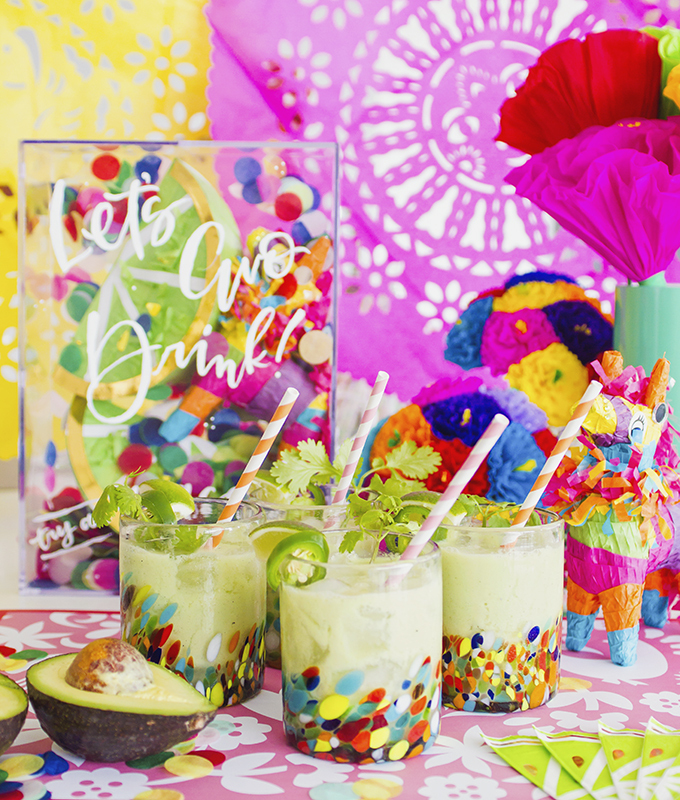 The great part is that an avocado themed party is acceptable any time of the year, whether it’s Cinco de Mayo or not. Because who doesn’t love avocados? 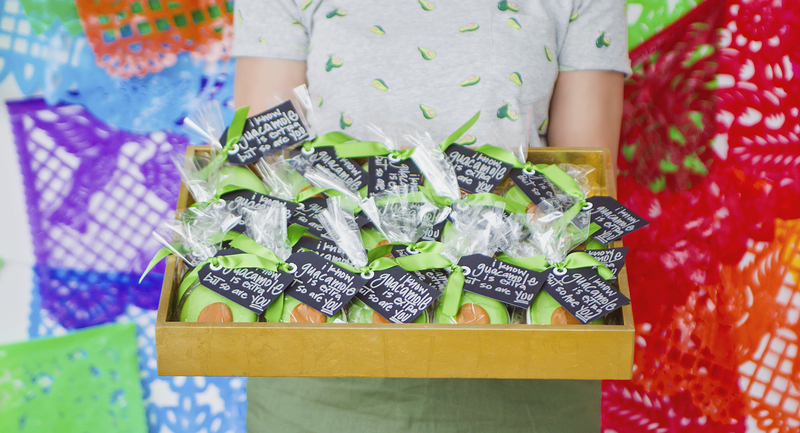 Particularly with summer coming up, we have no doubt that you’ll find the perfect reason to host an avocado themed party! We had the absolute best time thinking up ideas for this and executing on them – and eating them! It was such a fun day, and we can’t wait to share all the details with you, so keep on reading. And we mean all out. First, brainstorm the ingredients. Get creative with this! Think of not only savory options, but sweet options as well. Likewise, think not only of veggies, but fruits too. In the end, we decided on twenty ingredients, because more is more! Am I right? 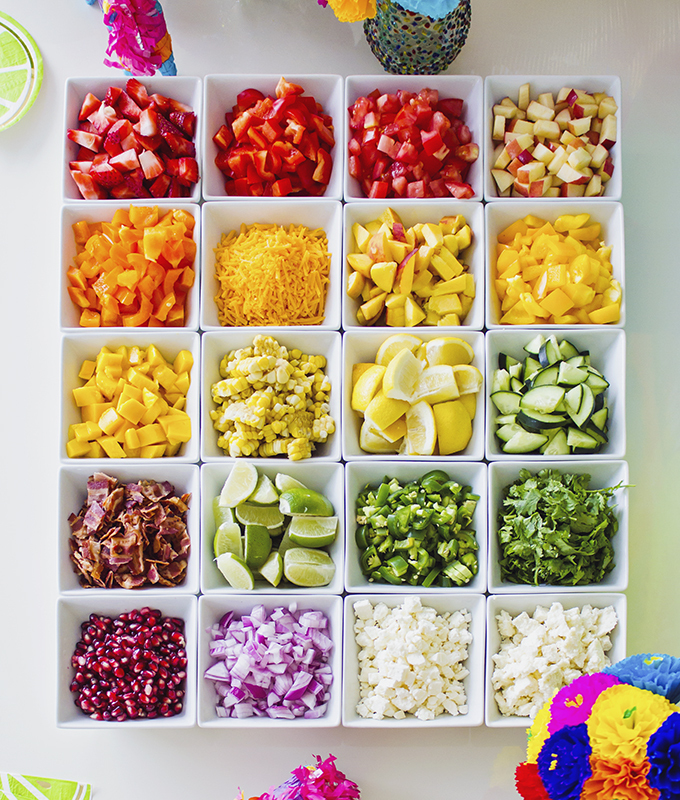 Options are truly endless, but to get your thought process going, here are the twenty we chose: limes, lemons, tomatoes, cilantro, jalapeños, purple onions, queso fresco, mango, cucumbers, yellow bell peppers, orange bell peppers, red bell peppers, bacon, feta, cheddar cheese, Greek yogurt, corn, pomegranate, peach, strawberries, and apples. Then, you’ll need to arrange your ingredients in a visually appealing and functional manner. We chose to use these square bowls to create a grid-like array. Of course, we decided to display the ingredients in rainbow order, but you can do whatever you’d like! Next, pre-make a ton of the guacamole base. A guacamole is no fun if you run out of guacamole! This base can be as simple as smashed avocados with a bit of lime juice and a pinch of salt. 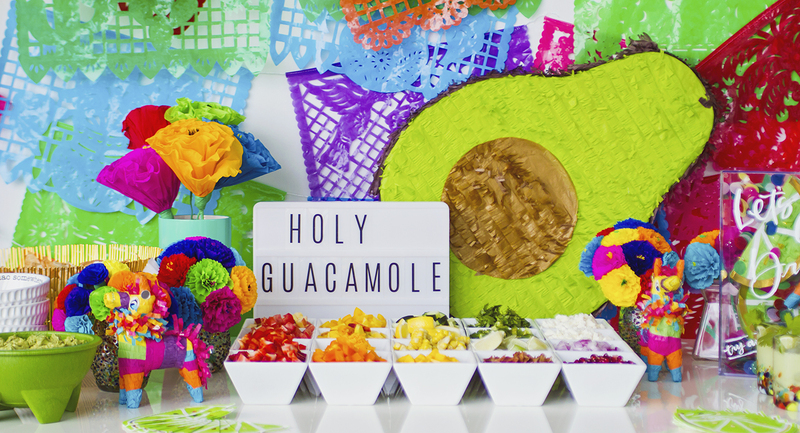 Put the guacamole base, along with some delicious tortilla chips on the buffet table, and you’re ready to go! We went with our favorite Siete chips. Not only do we love each of their three flavors, but we can’t help but adore their packaging. And then it’s time for you and your guests to enjoy! 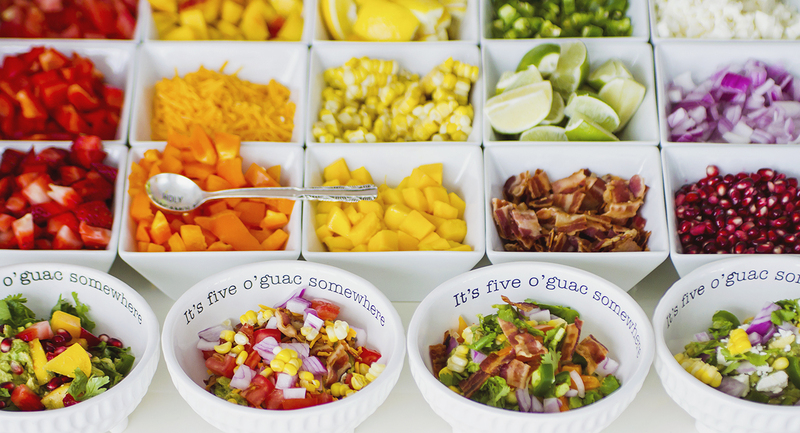 We found really cute bowls that say “it’s 5 o’ guac somewhere“! Can you even handle the cuteness? It’s always nice to carry the theme throughout, so we certainly couldn’t resist these. 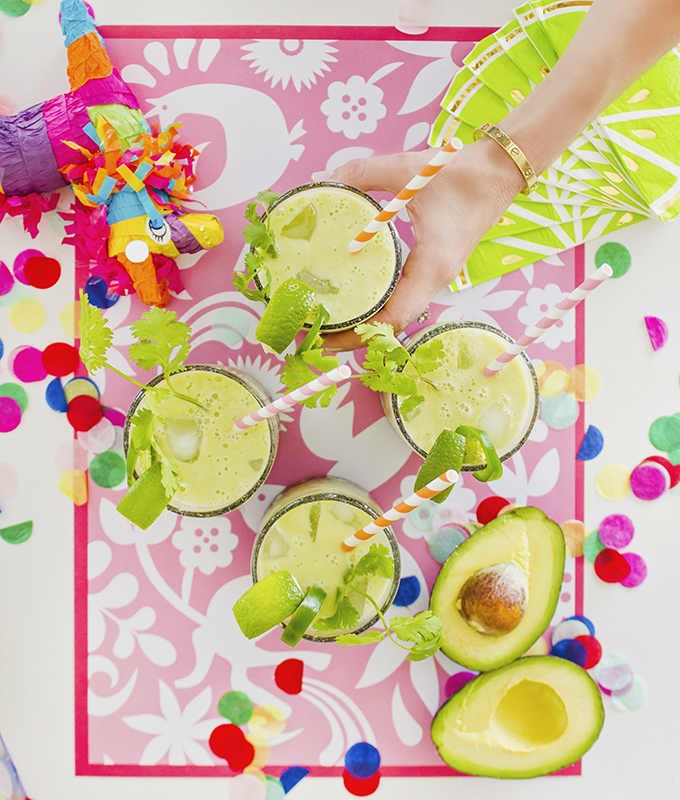 Would a guacamole bar be complete without margaritas to complement it? The answer is obviously no. But rather than doing any sort of margarita, Marla came up with a spicy avocado margarita.Do you sense a theme here yet? While that initially might sound odd to you, it’s absolutely delicious. As well, make sure your guests know where the bar is by way of a fun DIY sign. This will make it that much more special and festive. We found an acrylic box and Gypsum & Co. did hand lettering for it, and then we filled it with confetti and mini piñatas! Put all ingredients in a blender and blend well. Add garnish if you’d like! 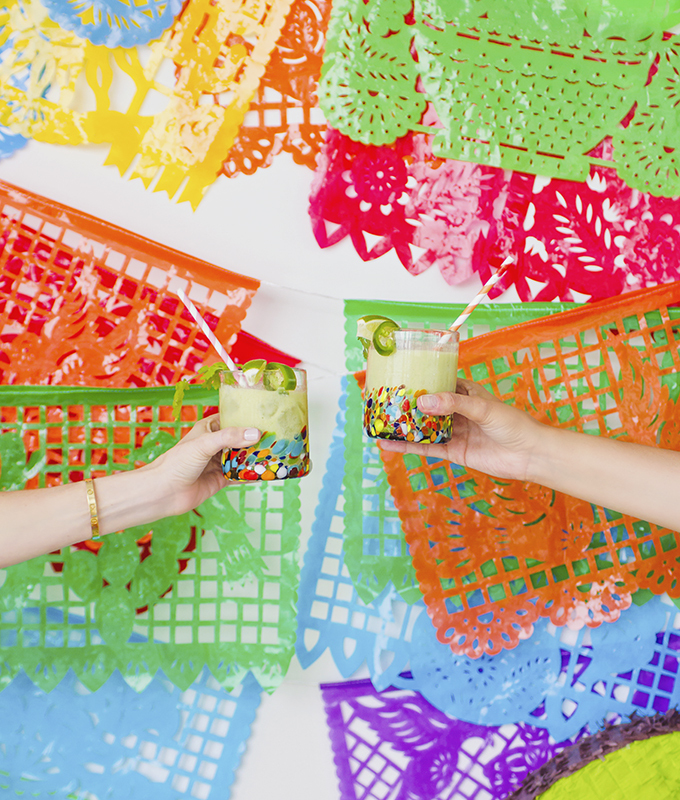 And what party would really be a party without a photo backdrop? 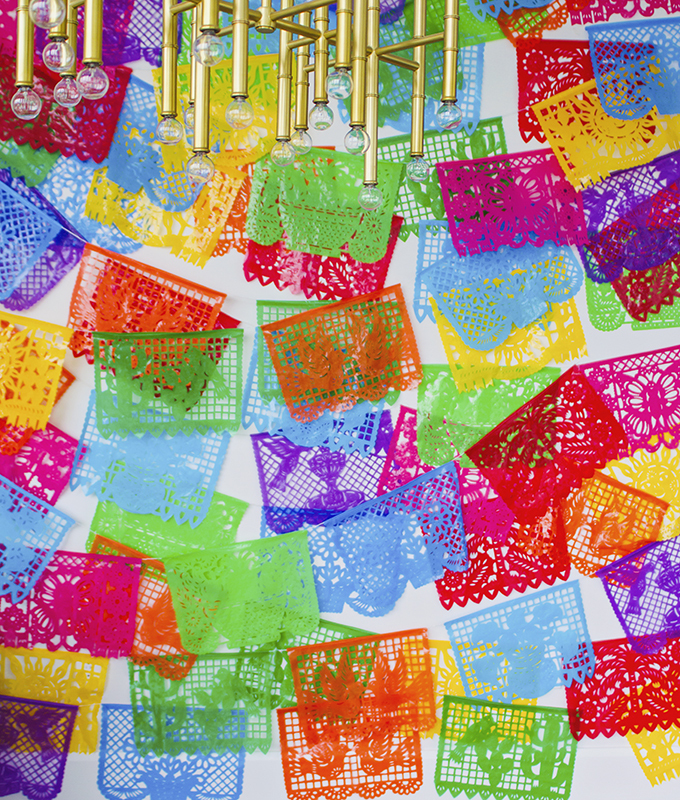 We decided on an easy, yet bold and statement making, papel picado banner backdrop. We simply hung them all over, in no set order, trimmed the ones that were too long, and taped them up. How colorfully fun did it turn out?! And so easy! 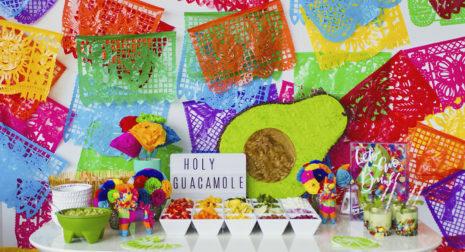 No photobooth is complete without adorable (and dare I say cheesy) photo props! 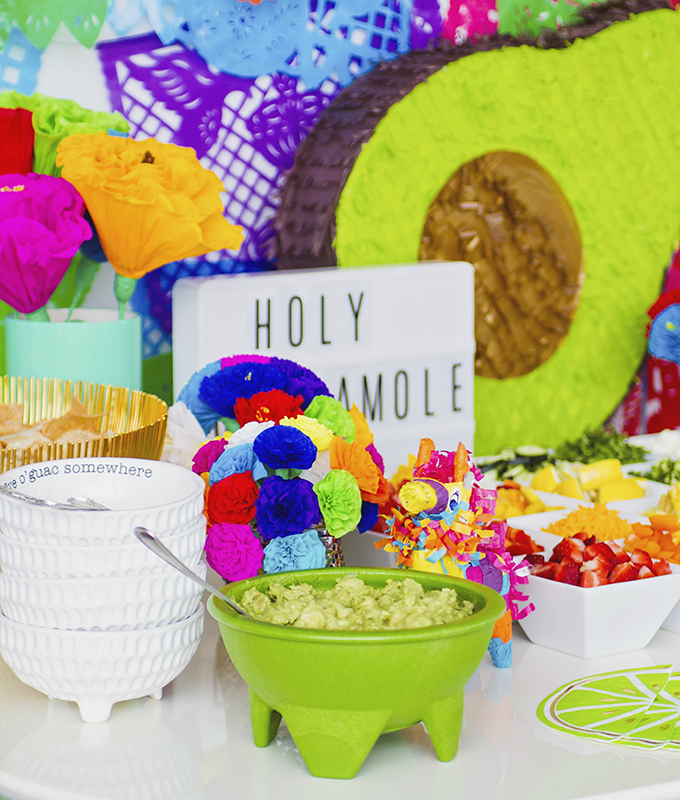 So, we went with large avocado piñatas, paper flowers, mini piñatas, sunglasses, and silly straws. 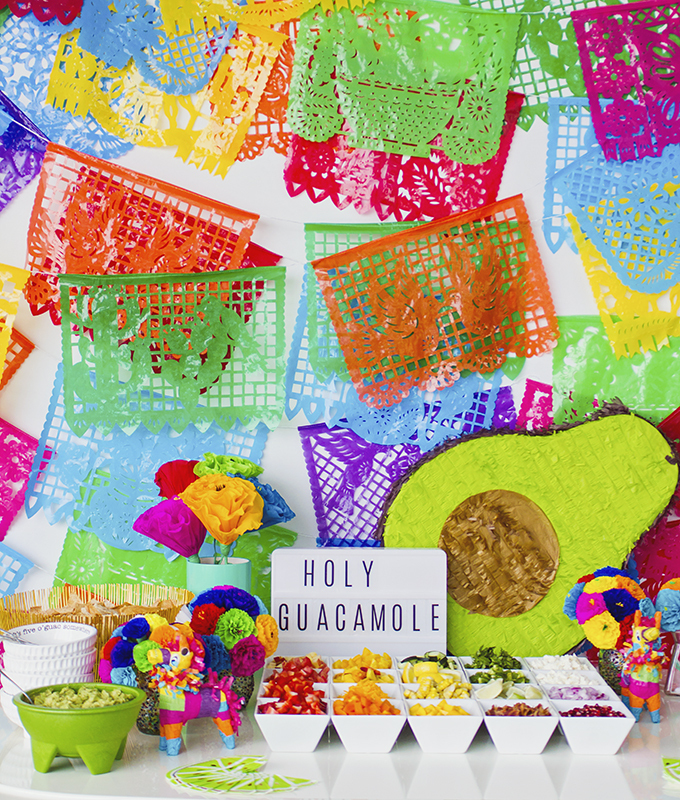 You can certainly also add in maracas, sombreros, or any other festive items. 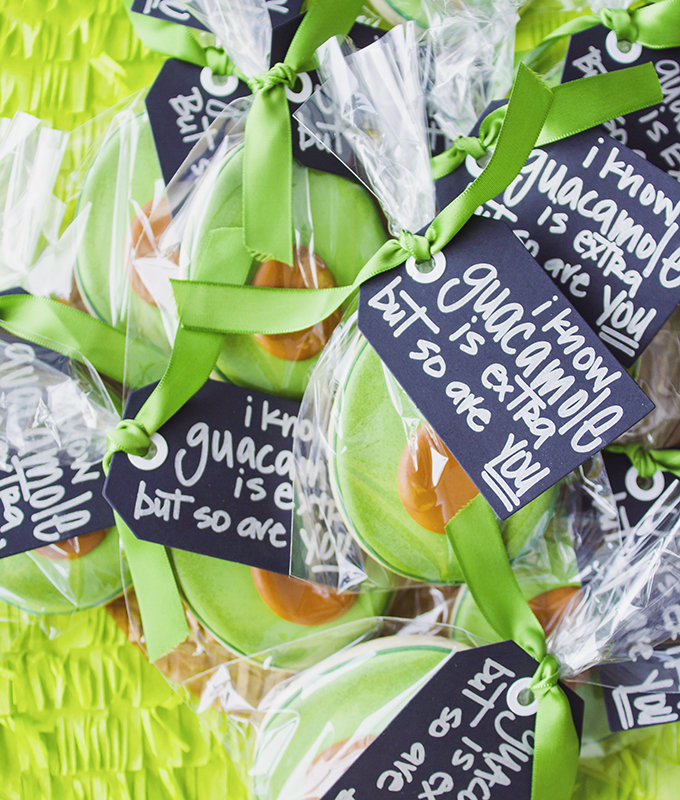 Once your guests enjoy their guacamole creations, they’re going to want something sweet! Who can resist an avocado pun? Not us! And finally, don’t forget to dress the part! 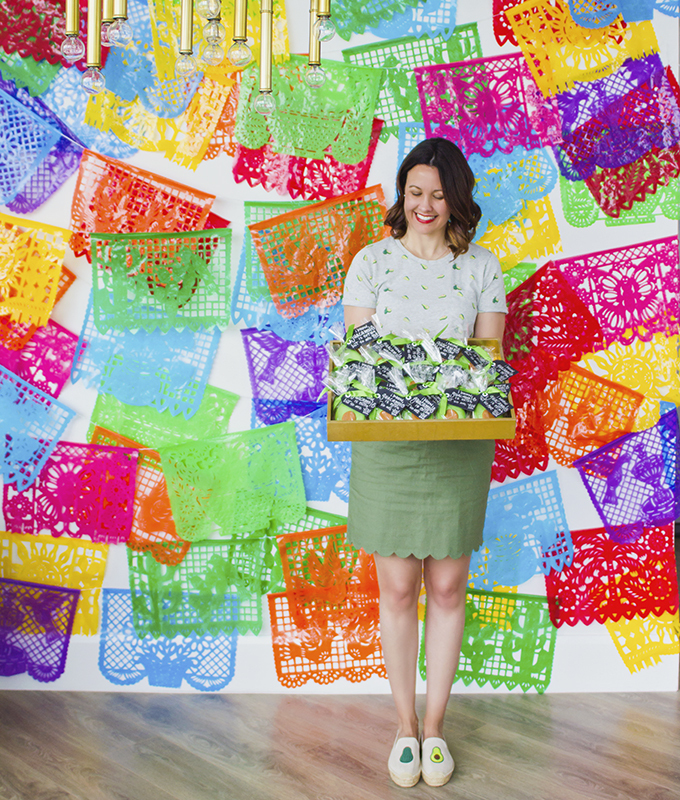 As you see here, Carrie found the cutest avocado tee and paired it with a green skirt, avocado espadrilles, and festive earrings. 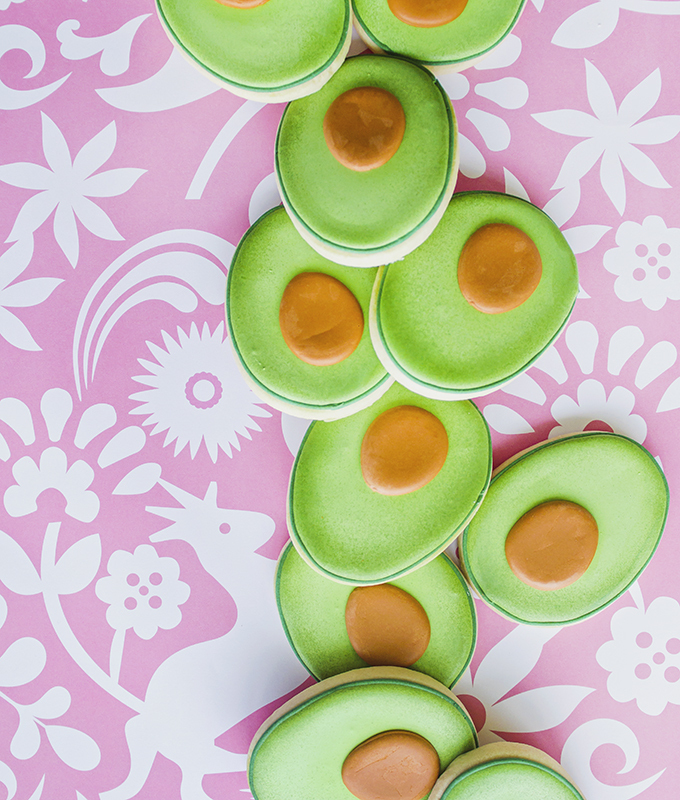 There are so many cute avocado / guacamole pieces out there, so we’ve linked a bunch below for you. 1. Fun, right?! Like we said, we had such a blast putting this together, and we hope you enjoyed it just as much. 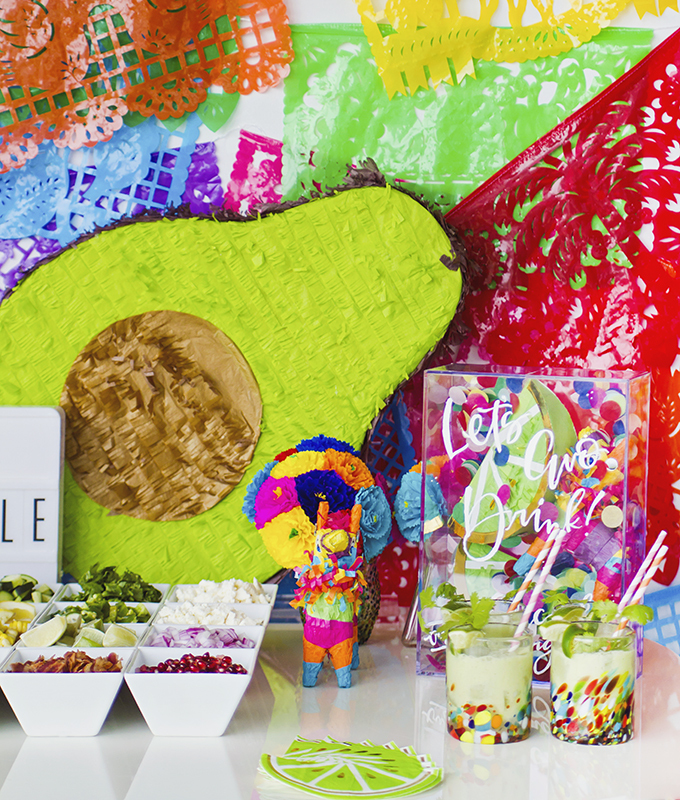 We’d love to see your avocado themed party, so be sure to share photos and tag us @carriec! 2. You can catch Carrie’s daily look here and make sure to check out her current favorite items on the homepage. 3. Have an awesome week! Plaid on gingham on denim. I could live in this dress.